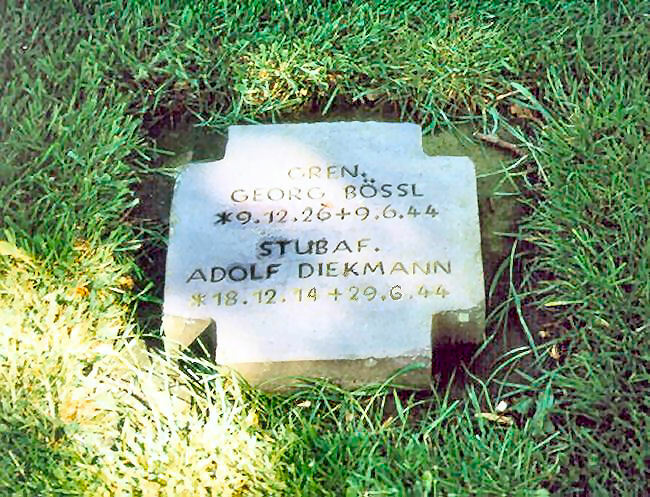 The grave of Sturmbannführer Adolf Diekmann under the trees at La Cambe German Military Cemetery in Normandy, France. The date is a little hard to make out due to the way the sunlight is falling across the inscription. The dates are: 18.12.14 to 29.6.44. Diekmann was first buried at Banneville temporary cemetery in the Calvados Department and moved to La Cambe on 16th January 1957. Notice the age of Grenadier Georg Bössl, just 17½ years old.